UPDATED: Mon., Feb. 11, 2019, 7:23 p.m.
Another winter storm Sunday into Monday dumped more snow across the area, and winds blowing snow across roadways made driving treacherous, causing more postponements to district basketball tournaments across the state, including in Spokane and the Tri-Cities. 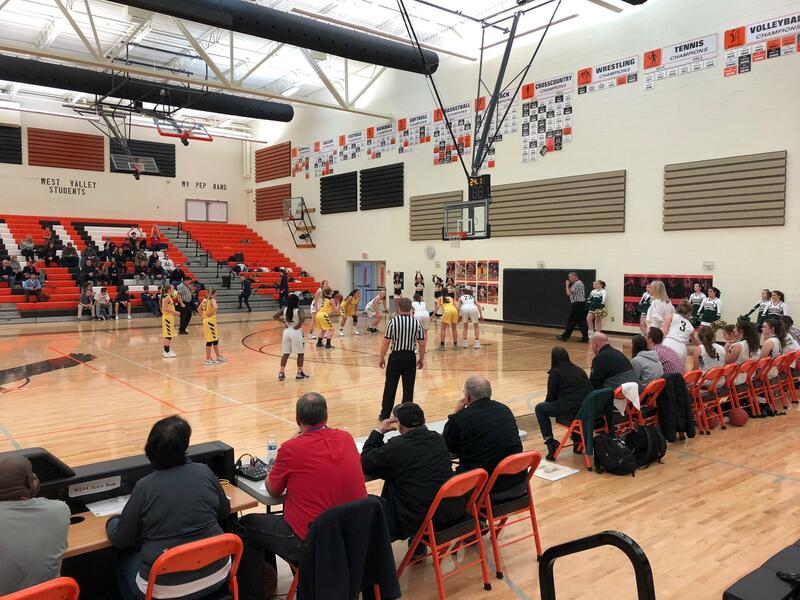 The District 8 4A and 3A tournaments between the Greater Spokane League and the Mid-Columbia Conferences, already postponed from over the weekend, were pushed back again. The Tri-Cities school districts preemptively closed schools for Tuesday, along with all after-school activities. The 4A semifinal and loser-out games that had been moved to Tuesday from over the weekend were rescheduled for Wednesday, with the second round of loser-out games moved to Thursday. The 3A semifinals were moved to Wednesday and the loser-out games pushed to Thursday. The championship and third-place games are still scheduled for Friday and Saturday at the Spokane Arena. The 3A gymnastics regional qualifier, originally set for Friday, then Tuesday, was postponed with no make-up dated scheduled. The WIAA on Monday announced that leagues across the state could have up until Monday to complete their district tournaments to decide seeds to state. The winter weather has added another complicating layer to logistics and coaching in these district tournaments. West Valley high school hosts the 1A and 2B tournaments. There were eight games in the 2B brackets scheduled for Monday, but only three were able to be played due to travel complications from the outlying schools. The other five games were moved to Tuesday, along with the semifinal games. If the snow in the forecast for overnight Monday into Tuesday comes to fruition, the schedule gets that much more compacted. And with an AAU tournament planned for the weekend at West Valley, things could get quite complicated. Athletic director Jamie Nilles says the weather hasn’t done him any favors this week. “The tough thing is that it obviously changes the brackets and the 2B tournament here, we have to get a lot of games in. It’s kind of per (school) district. One district could have one team or two teams can’t come that will affect two other schools they’re supposed to play that possibly could get here. One of the teams that could play on Monday, the Northwest Christian girls, beat Kettle Falls 60-26 in a loser-out game. Coach Talara Frost said it’s been challenging to keep her players focused with all the postponements. The Crusaders’ Saturday game, set for 12:30 p.m., was cancelled at 10 a.m. that morning. Frost said the “will we, won’t we” aspect has been tough to deal with. Frost said school had a delay on Monday, then her players got out early for a team lunch. The distractions add up. “We’ve all been talking about it – just how complicated this is going to get because it just starts compounding. Published: Feb. 11, 2019, 7:15 p.m. Updated: Feb. 11, 2019, 7:23 p.m.